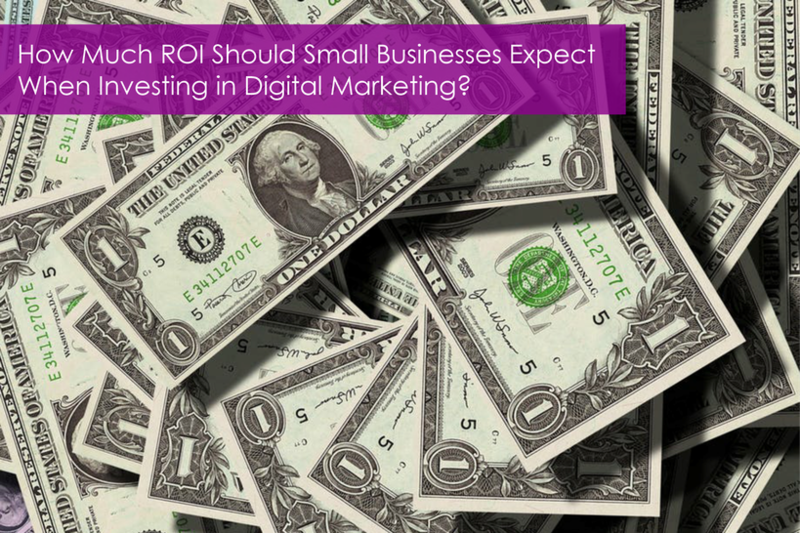 How Much ROI Should Small Businesses Expect When Investing in Digital Marketing? When you spend $1 on digital marketing, how much should you expect in return? What does ROI mean, exactly? When we look at return on investment (ROI), we are really talking about revenue. There are lots of key performance indicators (KPIs) we can consider when it comes to data and insights, such as reach, impressions, engagement, leads, etc., but the bottom line is how much money are you gaining in exchange for the investment you are spending? How much ROI should I expect for my business? Start up ROI is difficult to calculate but most digital agencies set their goal at a 5 to 1 (5:1) ratio. This means that, for every $1 you spend, you would hope to receive $5 in sales (revenue.) While aggressive online advertising (i.e. Facebook ads) can certainly improve on that 5:1 ratio (I've seen a ratio higher than 10:1, which is exceptional), if you are not investing in a full marketing campaign you will see a lower ratio. How long will it take to see a positive ROI? This really depends on how aggressively you approach online marketing and how much groundwork has been laid. While we like to see a 5:1 ROI within 6 months, it can take up to a year (or even longer) to really see your efforts and investment pay off with digital marketing. This is because, most of the time, people prefer to get to know you, like you and trust you before they buy. What will help speed up a positive ROI? Promotions - coupons, discounts, giveaways, challenges, contests, etc. - will help grow your ROI faster. Most of the time, people want to test the waters and try your product or service out before making a bigger commitment. How do I calculate my digital marketing ROI? The ROI calculation is done by adding up all of the marketing costs associated with acquiring a new customer. You will need to factor in all of your direct marketing costs as well as your overhead expenses. It is not easy to calculate the revenue generated from all of your digital marketing activities because it can take a long time (think 6 to 9 months) before a customer is ready to buy. Analytic programs are getting better about providing better insights over time and across different services. How does Vibrant Digital VA help small businesses achieve a positive ROI? Here at Vibrant we are serious about tying our marketing activities to your ROI. We treat your ROI as a golden metric and focus our efforts on the ultimate outcome: growing your business. What type of ROI have you gotten from your marketing efforts? What questions do you have about digital marketing ROI? Please comment below.